Belkin In-Car Phone Charger. Good call. In business, staying connected is everything. So it’s important to keep your smartphone or tablet fully charged. And now, with this handy USB car charger, you can do so while you’re on the move. It’s small enough to store in your glove compartment, and it comes with a detachable Micro USB cable or an Apple lighting connector. 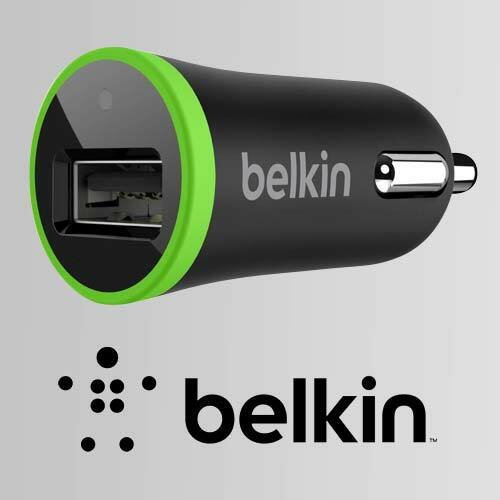 The Belkin In-Car Phone Charger is compatible with most Apple, Samsung, LG, Nokia and HTC smartphones. Click 'Redeem' and your Belkin In-Car Phone Charger will be requested. You’ll need to contact us to specify your cable preference (Micro USB or Apple). Your Belkin In-Car Phone Charger will then be sent by post to the address that you have registered with Dulux Trade Points. Please allow up to 10 working days for delivery. 2. The charger will be supplied with a detachable cable and is available with either micro USB or Apple lighting connector. Please use the ‘Contact Us’ form to specify your cable preference or call (01) 893 4992 to speak to a member of the Dulux Trade Points team. Please select the ‘micro USB cable’ if you have an Android, Windows, Blackberry, LG, HTC or Nokia phone. Please select ‘Apple lighting connector’ for iPhone 5 models and above. If you have any other phone please contact the Dulux Trade Points Helpdesk prior to redeeming this reward. The cable is detachable and the customer’s own phone cable can be used in conjunction with the charger base. 3. Phone chargers will be sent to the address registered with Dulux Trade Points. Deliveries will be made using An Post/Royal Mail services. All Orders will be sent by Registered Post and will require a signature on arrival. 4. Phone chargers will normally be received within 10 working days. Where possible we will try to meet all delivery requirements but neither Dulux nor TLC Marketing shall be liable for any loss incurred either directly or indirectly by failure to meet the delivery date and time indicated at the time of order being placed. ‘Loss’ in this instance includes loss of profit, costs, damages, charges or other expenses. 5. Risk will pass to the customer upon delivery. Neither Dulux nor TLC Marketing can be held responsible for lost, stolen or damaged phone chargers following delivery to the recipient. The phone charger will NOT be replaced or refunded if lost, stolen or damaged. 6. The promotion is not valid in conjunction with any other promotion and is subject to availability. 7. There are no cash or other alternatives and no cash refunds will be given. 8. The promotion is not open to employees of TLC Marketing or Dulux.